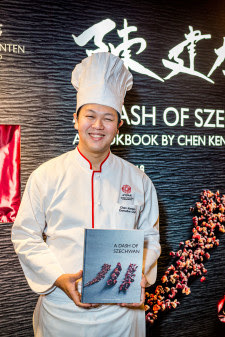 Chen Kentaro, Executive Chef of Shisen Hanten by Chen Kentaro—Singapore’s highest Michelin-rated Chinese restaurant, draws on three generations of culinary heritage to complete his first English cookbook, A Dash of Szechwan. The collection of 50 recipes, some of them never before shared, features Chef Kentaro’s own take on family recipes and Shisen Hanten signatures. Also included are recipes originally developed by his grandfather, Chen Kenmin—lauded as the “Father of Szechwan cuisine” in Japan, and his father, Chen Kenichi—the renowned “Szechwan Sage” and longest-running Iron Chef Chinese. From tasty starters such as Foie Gras Chawanmushi with Crab Roe Soup, Capsicum and Century Egg with Fragrant Dressing, and Steamed Chicken with Mala Sauce, to hearty stews and popular favourites such as Stir-fried Lobster with Chilli Sauce, Dan Dan Noodle Soup, and Chen Family’s Mapo Tofu, Chef Kentaro takes readers on an easy-to-follow journey through the bold and versatile flavours of Szechwan cuisine. Stunning food photography fills the pages of the cookbook, and peppered throughout are useful tips and visual step-by-step guides on cooking and preparation techniques. Chef Kentaro adds personal background stories to the mouth-watering recipes, and dedicates a pictured glossary for easier reference of some of the more essential and commonly mistaken ingredients featured in the cookbook. He also includes recipes for stocks, sauces, and marinades that can be used for a great variety of dishes. The limited-edition, hardcover cookbook is exclusively available for purchase at Shisen Hanten by Chen Kentaro, Mandarin Orchard Singapore. Each copy has been personally signed by Chef Kentaro.